I'm finally getting to the detailed rig counts for last week. 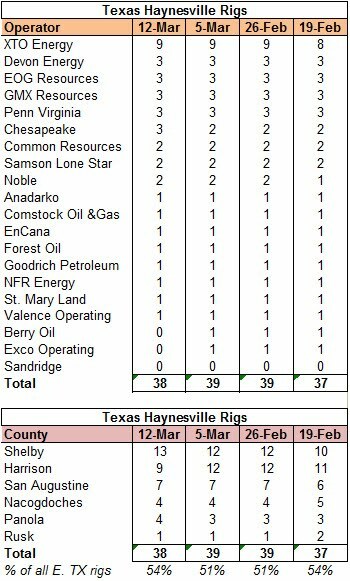 I started with east Texas, which saw a seven rig decrease overall but only a one rig decrease in the Haynesville Shale, from 39 to 38. Last week I accidentally double counted a rig (sorry), so the table below reflects the correct data from this week and last. I'm working on Louisiana, but it might not be posted until tomorrow.